Buckwheat is a gluten-free valuable raw material to be used for the production of functional foods. Taking into consideration its nutritive value and potential benefits to human health, an attempt was made to explore the potentialities of buckwheat by incorporating into 9 products which are categorized according to their susceptibility of spoilage. Under perishable category, Fruit Custard (FC) was more accepted than Vegetable Upma (VU) and Laddu (L), under semi perishable category, Sweet Mathri (SM) was more accepted than Methi Thepla (MT) and Vegetable Paratha (VP) (P≤0.05) and under non perishable category, Crunchy Masala Puri (CMP) was more accepted than Moong Dal Crispies (MDC) and Khakhra (K) which are (P≤0.05) on par with basic. Shelf-life studies of sensory qualities of non perishable products (CMP, K and MDC) revealed that there was no significant difference in the sensory attributes and the products was stable for 3 weeks (21 days) indicating the presence of polyphenols which also has anti-microbial properties responsible for its long shelf life. Nutrient analysis indicated that iron was more in variations of semi perishable (SM-8.0mg) followed by perishable (L-4.3mg) and non perishable products (K-4.0mg)/100 grams, Calcium was analyzed to be more in variations of non perishable (MDC-206.6mg) followed by perishable (L-200.4mg) and semi perishable products (SM-181.6mg)/100 grams. The study thus revealed that the consumption of 50-60 grams of these developed products can meet 1/5th to 1/8th of the days recommended allowance of iron and calcium (19mg and 600mg respectively) for an adolescence Indian girl (10-12 years). 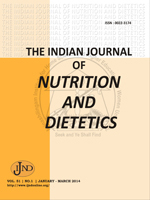 Buckwheat, Gluten-Free, Functional Foods, Iron, Calcium, Sensory Quality, Shelf-Life Studies.